Posted by Ronald Cifuentes on July 20, 2017 at 1:54 PM. Filed under Around the Home, Power . Extension cords are not something you normally find yourself thinking about or even researching online. When you think about extension cords, usually what comes to mind are solid colors (usually in brown, black or white), light and flimsy or bulky heavy duty cords that all get tangled and get in the way. Well now it’s time to change the way you think about extension cords with Cordinate Designer Extension Cords. Cordinate extension cords have many differentiating features: they have a stylish braided color cord, a low profile plug, and are available in a variety of styles. These cords are not only visually appealing but say goodbye to the boring solid colors you are used to. Add color and personality to your home or work area with Cordinate’s line of beautifully woven braided extension cords. These cords come in three different finishes to complement just about any décor style: mint, gray and brown. Besides the aesthetics, these extension cords are all 10 feet in length for extra-long reach. The woven braided cord also helps keep the cords from tangling. The other important end of the extension cords are the various head styles that fit any power needs you may have. The outlets feature tamper-resistant safety outlets to block insertion of foreign objects in order to prevent accidental shock and assist with child proofing your home. The USB ports feature rapid charge technology that give you the ability to charge certain USB powered devices up to 40 percent faster! All of the Cordinate extension cords feature surge protection to protect your electronics from harmful power surges. 3 Polarized outlets – Ideal for lamps and small appliances. 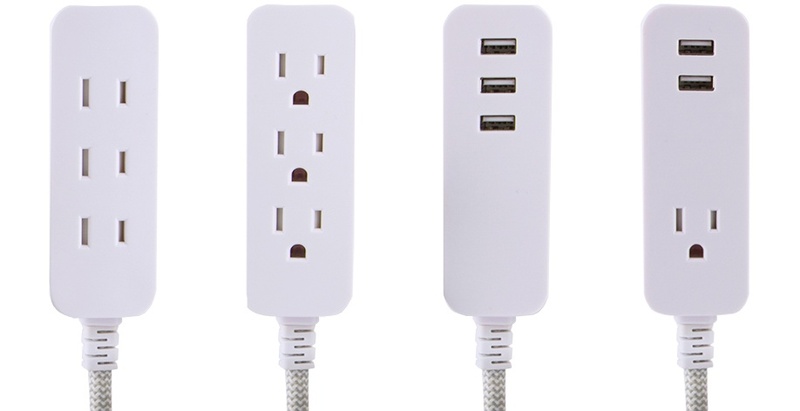 3 Grounded outlets – Ideal for larger devices like HDTVs, computers, or gaming systems. 3 USB - Perfect for a desk or nightstand to power and charge USB powered devices. 2 USB + 1 Grounded outlet - For a mix of charge and power needs. The beauty of Cordinate doesn't end at the cord either, there is much to say about the low-profile plug. Most extension cords feature a standard plug where the cord sticks straight out from the outlet. These standard plugs can be annoying when using outlets that are behind or near furniture. In this case, with a standard plug there are three possible scenarios: move your furniture, use the outlet and have the furniture pushing up against the plug with an awkward space between the wall and furniture or use a different outlet. With low-profile plugs, you can use these hard to reach outlets while avoiding moving furniture or having furniture push against a plug. Get rid of that bland and unsightly extension cord and update to Cordinate Designer Extension Cords with Surge Protection.